In addition to offering a great, diverse selection of plants, Johnnye Merle’s also provides top notch garden design services. Below is a project we just worked on this past week. Above is the ‘before’ photo. For this project, the client wanted to help with a big area she recently had stone and brick laid out in. 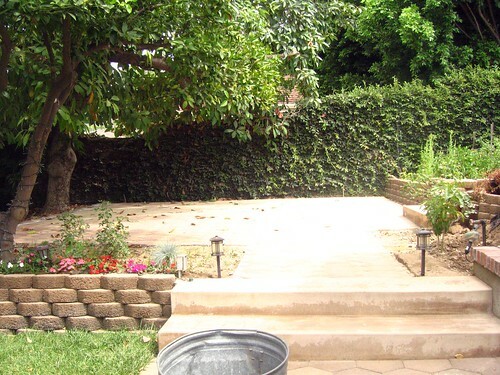 Having lived in the home for only a year now, this was one of her big ‘pet peeve’ areas; before the stone, it was a strange, elevated ‘platform’ featuring weeds and dirt! 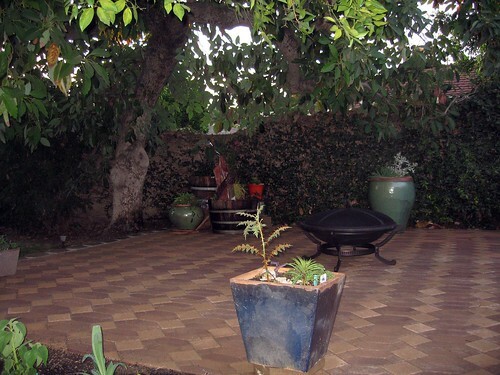 As it sits below a giant avocado tree and is in the direct line of sight from the other outdoor sitting area, we suggested she have it paved or set in stone, and turn it into a fun seating area with pots, a water feature and fire pit. Once she had the hardscape completed, she reached out to us for help with selecting pots and plants, placing and planting them, designing and building the water feature, and picking out garden furniture and accessories. This is still a work in progress, but you can see from the photos below how much we were able to accomplish in one day! 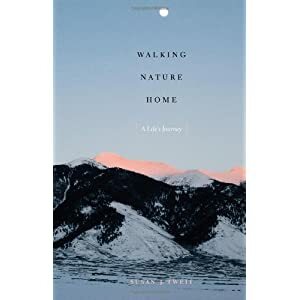 Last week, we helped her pick out a selection of pots that accented her garden and reflected her own design tastes, purchased wine barrels for the water feature, and we put together a plant selection for her as well. Then, we put it all together - utilizing existing stones, bricks and random flagstone pieces, we created ‘risers’ for the pots, grouping them in interesting little vignettes. We are very big on using existing materials that a client might have - the previous homeowners left behind a huge selection of random stone pieces, so it was great to put those into use. The wine barrel water fountain also features lots of 'found' objects. We also cleaned up and planted to flower bed areas that are adjacent to the patio area. We planted the pots using plants that are primarily drought tolerant and ‘architecturally interesting’, proving year round diversity in color and foliage structure. For the bedded areas, which are shaded and damp, we went with shade loving plants that could deal with the run off of water that happens because of the slope of the deck. 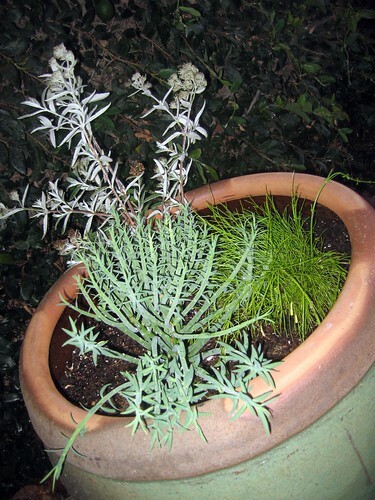 Same goes for the water feature plants, which are in a shady corner that tends to stay moist. 'After photo'; not the best shot, sorry! 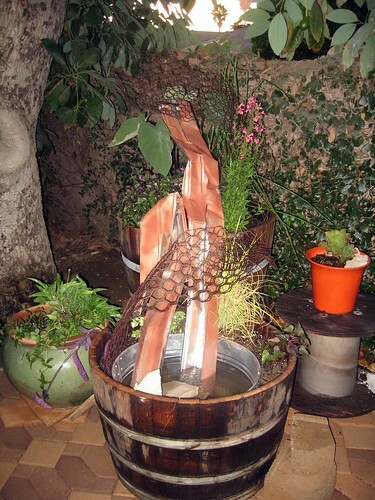 Water feature - we built this using wine barrels, a galvanized tub, some rain gutter pieces and a small water pump. We love how it turned out! More potted plants - notice how we utilized existing stone materials to give the pots more height and to 'polish off' the groupings. In addition to providing the design work and plant selection, partnering with Johnnye Merles on a garden design project can also SAVE you money. 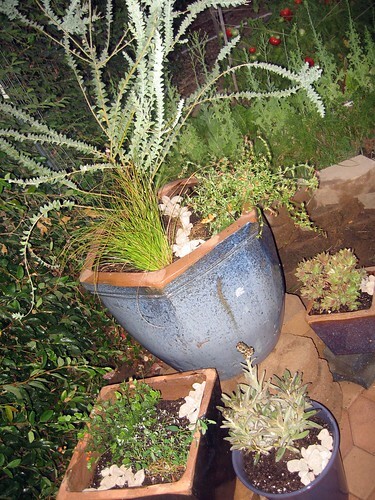 For this project, for example, the client was able to purchase pots at a wholesale price, saving considerable money, and likewise the cost of plants was discounted since she was also utilizing our design services. Plus, collaborating with a garden designer can help to avoid mistakes - small and large - than can sometimes cost money as well! If you are interested in our design services, please feel free to email us for more information!